The other night I decided to watch the original Evil Dead that was directed by Sam Raimi in 1981, for such an old film it was far better than what I was expecting. The special effects were rather impressive for a film that was produced in the early 80’s, Evil Dead also features some claymation towards the end that also adds a humorous twist to the overall film. So what is Evil Dead and why do I like this film so much? Well the very first Evil Dead did scare me believe it or not, although there were particular sections of the film that were just hilarious! The claymation actually provided a very interesting effect to the film, the stylised violence features a unique aesthetic that is quite imaginative for a 1980’s horror flick. So if you haven’t watched Evil Dead I would definitely recommend visiting your local DVD store, especially if you enjoy cheesy horror films! In fact, the violence and the claymation is rather cheesy, although the visual effects are throughly entertaining. So Evil Dead features four young adults who decide to travel to a deserted cabin within the middle of woods where they discover ‘The Book of the Dead’ that welcomes evil spirits to the living world. The film explains that “the Book of the Dead was written in blood and bound in human flesh”, I must admit the book does feature highly detailed drawings of skulls, skeletons and other supernatural beings; whoever designed the book in the first place has impressive drawing skills thats for sure. So what really happens in Evil Dead? Well the main protagonist, Ash discovers ‘The Book of the Dead’ along with a tape recorder within the bottom of the basement, Ash’s friend Scott decides to take these new items back to the cabin where the entire group begins to listen to the unusual recordings from the tape player. As the group continue to listen to an old man speaking in Latin, the words suddenly conjure something evil within the woods. As a result, each person is possessed by a demon that was summoned by the Book of the Dead, meanwhile Ash tries to find a way to escape from the haunted cabin that becomes rather difficult when his possessed girlfriend tries to kill him. One thing leads to another and everything turns completely pear shaped, as the holiday retreat gradually turns into a disastrous blood bath. So I do find the visual effects rather impressive especially for a film with such a low budget, what I do find rather unsettling are the camera angles. The film provides the perspective of the demon, evil spirits that lurk around the cabin and the fast paced motion does create a level of suspense and anticipation. Bruce Campbell does play an excellent role as Ash Williams, the main protagonist who finds himself trapped within the deserted cabin with his girlfriend, sister and best friend that are all possessed by some kind of Demon. 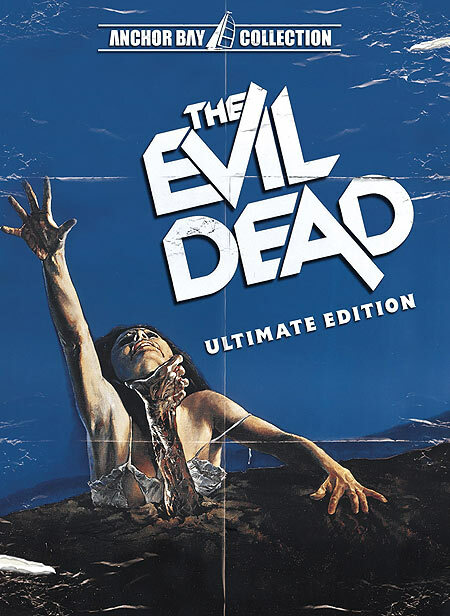 According to Kate Egan, The Evil Dead is an American cult classic that was produced by a group of university students including Sam Raimi and Robert Talbert during the late 1970’s, early 80’s. Raimi throughly studied other recognisable horror films, such as The Last House of the Left and The Texas Chainsaw Massacre, although the actual production of Evil Dead proved to be rather difficult due to financial circumstances. I personally believe that Sam Raimi has produced a very successful horror film with a low budget and a very small production team, which is quite remarkable really. There were some aspects of the film that did cause me to jump, although the acting and the visual effects do provide a level of humour, that do cause me to laugh uncontrollably. I have also noticed that the original Evil Dead has inspired the contemporary horror genre, The Cabin in the Woods for instance does feature a strong reference to Raimi’s 1980’s production. The narrative does feature a parallel to the Evil Dead, as four young college students travel to an isolate Cabin within the woods, although the director, Josh Whedon does provide a very unusual twist that would take anyone by surprise. So I have also realised that the skull continually reappears within Raimi’s Evil Dead, in fact I have noticed that the skull has become a very popular symbol within the horror genre. I’m not to sure why, although I would assume that the skull is used as a symbol of death, mortality, even danger. I have also noticed that the skull does appear when something dangerous or violent is about to occur, as soon as Ash opens ‘The Book of the Dead’, the cabin turns into complete chaos. So the other day I have realised that The Evil Dead is an actual trilogy, there’s Evil Dead 2 and Evil Dead: The Army of Darkness, which are two fantastic films produced by Sam Raimi. 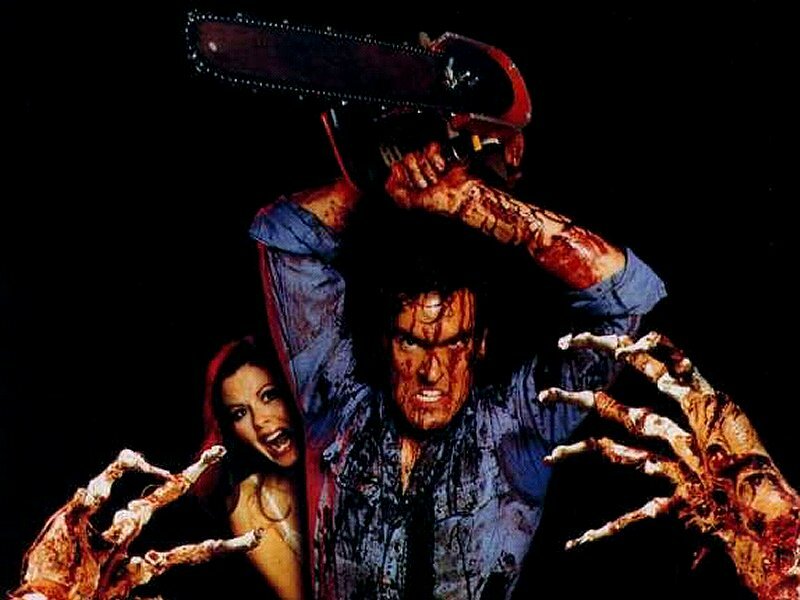 So Evil Dead 2 is basically a parody of the original Evil Dead that is one of the most entertaining horror films I have ever watched in my life. The violence is exaggerated to the extent where it’s almost impossible not to laugh, there are amputated limbs and laughing clocks flying left right and centre, that’s right laughing clocks along with laughing lamps and a possessed dear’s head that seem to haunt Ash’s Williams who cannot find a way to escape the cabin. The skull constantly reappears throughout Evil Dead 2, Ash finds his girlfriend’s necklace on the floor which forms the shape of the skull, in a way the skull is used as some kind of subliminal message. 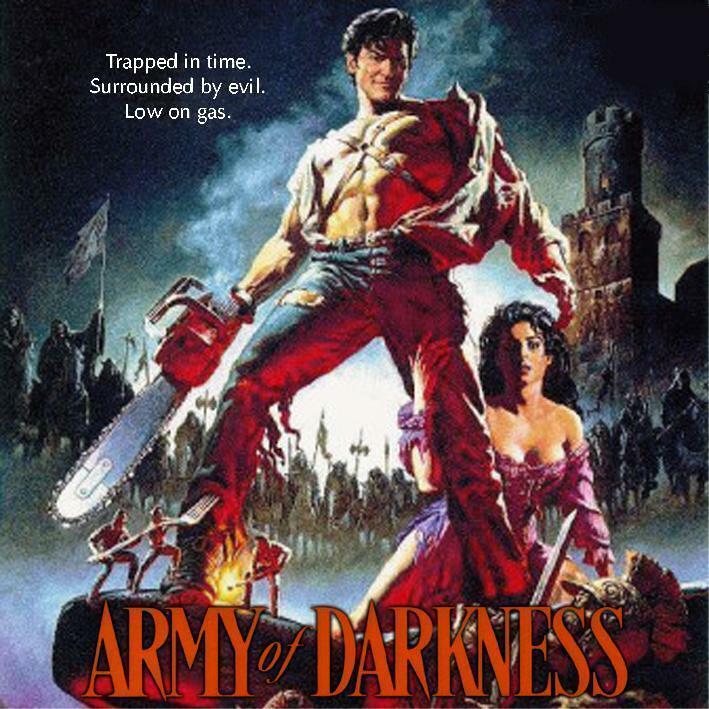 Evil Dead: The Army of Darkness on the other hand makes a rapid transition from a comedy horror to an action adventure, Ash somehow travels back in time in order to defeat the ‘undead’ that form an army of skeletons. So Ash decides to steal ‘The Book of the Dead’ from the graveyard that suddenly resurrects the dead, all of a sudden there are hundreds even thousands of skulls and skeletons that begin to attack the castle in order to retrieve the book. As ridiculous as it sounds, the film is extremely entertaining, the visual effects do add a level of humour, parody and satire. So if you are looking for something to watch then I would recommend watching The Evil Dead Trilogy, you can even watch the original Evil Dead and the Army of Darkness on Youtube! 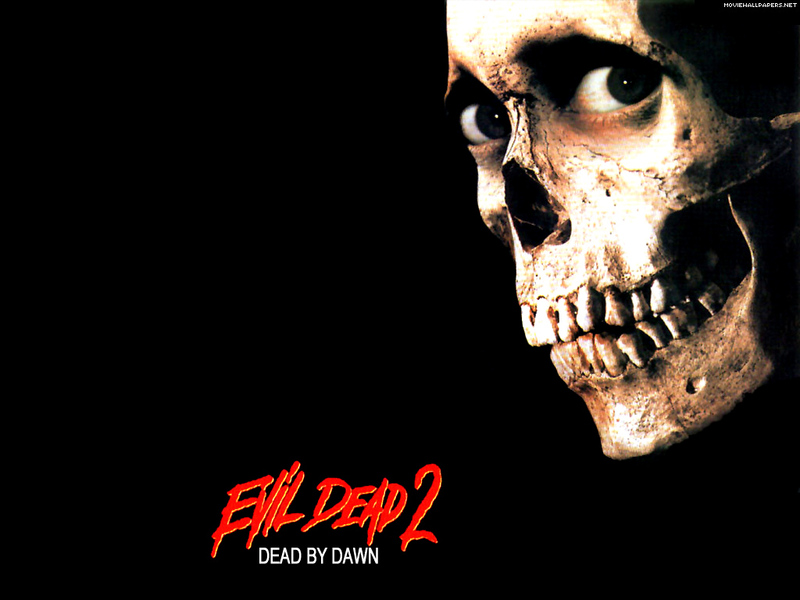 The DVD cover for Evil Dead 2 does feature some impressive advertising / marketing, the very front of the cover features a skull that significantly contrasts with the dark background, the advertisement definitely summaries the nature of the film. It would be interesting to compare the original Evil Dead within the 2013 remake that was released a couple of months ago, due to censorship I haven’t been able to watch the film at my local cinema but it will be interesting to see how Fede Alvarez appropriates this 1980’s classic.